What Is SFP Cable And How Is It Used? SFP cable, also known as 10G SFP+ cable, SFP+ DAC twinax cable or SFP+ AOC cable, is a form of high speed cable with Small Form Factor Pluggable Plus on either end. They are suitable for in-rack connections between servers and switches. SFP cable’s popularity can be attributed to that Cat5e copper cabling and 1000BASE-T have dominated data center interconnection application for years, however, the upgrading to 10GE, 40GE and beyond poses a significant hindrance in both power consumption and cost. At this point, 10G SFP+ direct attach copper swoops in and becomes a new favor of Top of rack switching. SFP twinax cable which replaces two optical modules and a connectorized optical fiber with a twinaxial copper cable assembly offers the higher density, lower cost, and lower power 10 Gigabit Ethernet solution than other cable types such as 10GBASE-CX4 and CAT6/CAT6A 10GBASE-T. The SFP cables can be classified to 10G SFP+ DAC cable and 10G SFP+ AOC cable. SFP+ AOC features longer transmission distances(>100m), isolation from signal interference and crosstalk and higher signal transmission capacities but it’s more expensive than SFP+ DAC. SFP+ DAC consists of active DAC and passive DAC. Passive DAC cables have no signal amplification built into the cable assembly hence for ultra short reach(<5m), whereas active DAC cables have signal amplification and equalization built into the cable assembly for a litter longer reach(5-15m) in the same time with a higher price. We’ve already known that SFP+ is made to operate at 10Gb/s. And SFP28, as the enhanced version of SFP+, is designed for 25G signal transmission. SFP28 utilizes the same familiar form factor as SFP+, but the electrical interface is upgraded to handle 25Gbps per lane. To put it simply, 10G SFP+ cable and 25G SFP28 cable just has the same form factor but with different speed. What’s more, 25G SFP ports can support a full range of 10G SFP+, which means 10G SFP+ cable can be plugged into 25G SFP ports. How SFP Cable Is Used? 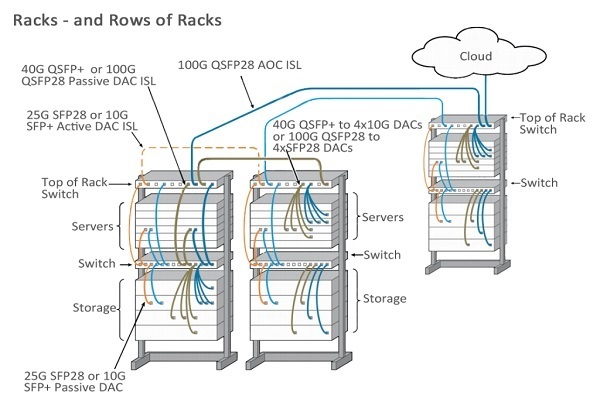 As 10G network is widely deployed in today’s data center, 10G SFP cables are commonly used in interconnect applications below 100m, such as server to switch or storage to switch interconnection in the same rack (Shown in the below picture). And now 25GbE is popular and 25G direct attach cable assemblies, such as SFP28 DACs, are already available in the market. For 40GbE, 40G QSFP+ DACs and AOCs are used. Of course, higher speed and more bandwidth are needed for spine switches. Thus, 100G DACs, like QSFP28 DACs are used in this case. With the convenience of plug and play technology, FS.COM’s family of 10G SFP cable delivers throughput that exceeds those of industry standards. 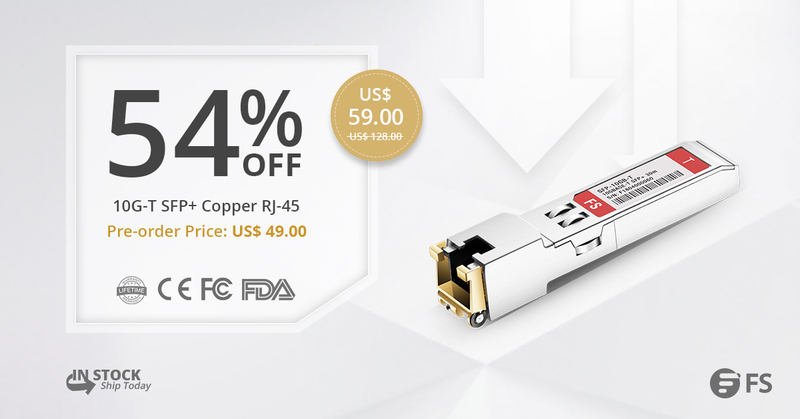 Besides, they also offer a variety of high speed interconnect DAC assemblies including 40G/56G QSFP+ cable, and 100G QSFP28 cables to satisfy the demands from 10G to 100G interconnection. All of direct attach copper cables can meet the ever growing need to cost-effectively deliver more bandwidth, and can be customized to meet different requirements. Related articles: What Is Twinax Cable? This entry was posted in Direct Attach Cable and tagged 10g sfp+ cable, AOC cable, dac cable, SFP cable, sfp fiber cable, twinax cable on February 6, 2018 by Admin. The Brocade ICX 7750 is a series of switches which can provide high-availability capabilities and flexible stacking architecture for 10/40G applications. Brocade ICX 7750 series switches are usually used for 10/40G aggregation and core distribution. Brocade ICX 7750-26Q is a member of Brocade ICX 7750 series, which is a 1U high performance switch with up to 32 40G QSFP+ ports (six optional). This post will offer optics and cabling solution for Brocade ICX 7750-26Q switches. The above picture shows a Brocade ICX 7750-26Q switch from FS.COM testing center. On the front panel of Brocade ICX 7750-26Q switch, there are 26 40G QSFP+ ports, ICX 7750-6Q module with 6 40G QSFP+ ports can be added on the rear panel of this switch. Thus up to 32 40G QSFP+ ports can be supplied by Brocade ICX 7750-26Q switch. It can support transmission applications for both 40G to 40G and 40G to 10G. Brocade ICX 7750-26Q can support 40G transmission for both short distances and long distances by using different 40G QSFP+ transceivers and fiber optic cables. The following picture shows the cabling methods for 40G point to point connection. Choosing the proper fiber patch cable for two QSFP+ modules, 40G data transmission between two Brocade ICX 7750 switches can be achieved. In this case, two Brocade 40G-QSFP-LR4 compatible transceivers and a length of LC to LC duplex single-mode fiber patch cable are being used. Brocade compatible QSFP+ to QSFP+ direct attach cables including (direct attach copper cables and active optical cables) are cost-effective alternatives for Brocade ICX 7750-26Q 40G connections in short distances. As mentioned Brocade ICX 7750-26Q switch can also support 40G to 10G applications. A 40G QSFP+ port can be splitted into four 10G SFP+ ports, which can achieve transmission between 10G and 40G. There is a wide selection of Brocade ICX 7750-26Q switch 40G to 10G connections. Fanout assemblies play an important role to support these connections. The above picture shows the commonly used connection methods for Brocade ICX 7750-26Q 40G to 10G connections. In this case, Brocade QSFP-40G-PLRL4 compatible transceiver is being used one the Brocade ICX 7750-26Q side. A length of MTP to four duplex LC breakout cable is being used to connect Brocade QSFP-40G-PLRL4 with four 10G SFP+ transceivers inserted in several 10G switches on the opposite side. Also, QSFP+ to SFP+ DACs and AOCs can also be used. Brocade ICX 7750-26Q switch provides flexible and high density networking environments. This post only provides the optics and cabling solution for Brocade ICX 7750-26Q switch. The following table listed the Brocade ICX 7750-26Q compatible transceivers and cables for you references. Kindly visit FS.COM Transceiver modules for BROCADE ICX 7750 page for more details about Brocade ICX 7750 series switches, if you are interested. This entry was posted in Direct Attach Cable, Fiber Cabling, How To, Network Solutions, Optical Transceiver Solution and tagged 40G-QSFP-LR4, Brocade ICX 7750-26Q, QSFP-40G-PLRL4, X 40G-QSFP-SR4 on September 19, 2016 by Alice Gui. In the past decades, the telecommunication industry has changed a lot. A wide selection of transmission methods has been introduced. Fiber optic cables are widely used in today’s network. It seems that copper cables are out of fashion. However, there are still many advantages of using copper networks. Copper cables are stronger and easier to manage than fiber optic cables. The cost of copper cable is much lower than fiber optic cables. In addition, copper network is easier to build, which eliminating the process of I/O. Now, copper cables are able to support data rate of 1G, 10G, 40G and even 100G, among which 10G copper based network is most commonly deployed. Currently, there are two types of standards which are designed for 10G copper based network: 10GBASE-CR and 10GBASE-T. Which one should you choose if you want to build a 10G copper based network? This article offers the answer. Several significant factors should be considered during the selection between the 10GBASE-T and 10GBASE-CR, which area transmission distance, transmission media, module type and cost. 10GBASE-CR is invented before 10GBASE-T. 10GBASE-CR can support 10G data rate up to 10 meters over twinax cable. While 10GBASE-T can support a longer transmission up to 100 meters over Cat6a twisted copper pair. Small package form factors are adopted in both 10GBASE-CR and 10GBASE-T applications, to meet the requirement of high density. SFP+ form factor is most commonly used for 10GBASE-CR applications. SFP+ passive direct attach cables and SFP+ active direct attach cables are usually used for 10GBASE-CR applications. The two SFP+ copper cables are terminated with a SFP+ module on each end. 10G SFP+ active direct attach twinax copper cable can reach a longer transmission distance than the passive one. The market now can provide a wide selection of SFP+ DACs for different types of switches and platform. 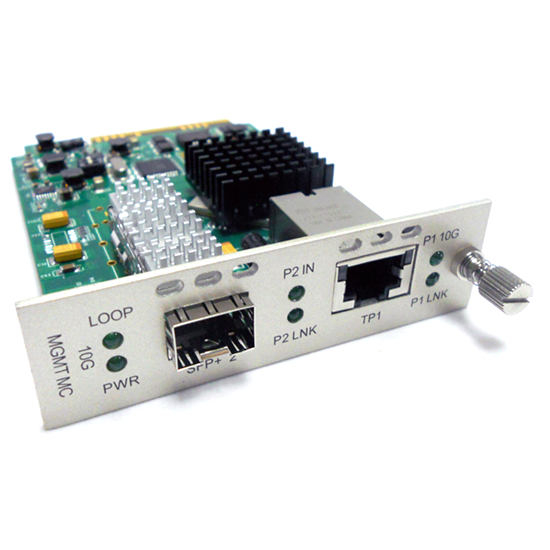 Network interface card with SFP+/XFP interfaces are often used for 10GBASE-T applications. Not all the vendors provide 10GBASE-T SFP+ modules. HP has provided a 10GBASE-T SFP+ module. However, compatibility of the modules is limited by the switch brand. This HP 10GBASE-T SFP+ module can only be used on HP switches. Thus, 10GBASE-T application is kind of limited for now. Put transmission distance aside, the cost for 10GBASE-CR cabling is much lower for 10GBASE-T cabling. For instance, a HP 10GBASE-T SFP+ costs around $ 1000 USD. However, the price for a 10G HP SFP+ DAC is around $100 USD. This price is lower to $ 23 for a 1.2 meter HP JD096C compatible passive SFP+ DAC in FS.COM. Thus, 10GBASE-CR cost less than 10GBASE-T in general. Generally, 10GBASE-T has the greatest advantages on transmission distances (up to 100m over Cat6a). Although, 10GBASE-CR can only reach up to 15 meters over twinax copper cable. It has great advantages on cable costs. In addition, most of our data center use for copper cabling are less than 15 meters, which means 10GABSE-CR can satisfy most requirement for copper cabling in data centers. Thus, 10GABSE-CR is suggested for most 10G copper cabling cases. This entry was posted in Copper Network, Direct Attach Cable, Network Solutions and tagged 10G SFP+ copper cable, 10GBASE-CR, 10GBASE-T on September 13, 2016 by Alice Gui. People want 100G Ethernet, meanwhile, they want to reduce the cost and increase the port density to the most. Driven by the combination of elements like that, 100G Ethernet standards and related optical transceivers have improved a lot in the past few years. As so many 100G Ethernet standards and package form factors are used, people might be confused by them easily. This post offers a detailed introduction about 100G Ethernet standards. The first 100G Ethernet standard was approved in 2010. After that tremendous changes have happened in 100G technology in many aspects. The first generation of the 100G standards use the 10x10G lane in electrical signaling. For media signaling, some use 10x10G and some use 4x10G. The second generation 100G Ethernet standards apply 4x10G signaling for both electrical and media. In terms of transmission distances, different standards can support different transmission distance. Now there are more choices for transmission distances ranging from 1 meter to 40 kilometers. Meanwhile, the package form factors also changed a lot. The first 100G transceivers CFP is much larger than that of the new one QSFP28. To offer an intuitive way to illustrate these 100G Ethernet standards, I will list them in the following table. The above table contains the 100G standards that published by IEEE and MSA, which are listed by the transmission distance from the top to the bottom. According to reports from many marketing reports, 100G optical component market will surge in 2016. FS.COM provide 100G solutions including transceivers, patch cable, cable management products, etc. Kindly contact sales@fs.com or visit FS.COM for more details about 100G Ethernet and products, if you are interested. This entry was posted in Direct Attach Cable, Optical Transceiver Solution and tagged 100G, 100G transceiver, Ethernet standard on May 6, 2016 by Alice Gui. During data center upgrading or migration to higher data rate like 40G/100G, the network designer is always pursuing for flexibility. This is because devices or cabling components with great flexibility can not only decrease the cost for upgrading, but also provide more possibilities for the data center in the future. Switch has always been the most important device data center. Thus, a flexible switch should support a variety of transmission media and data rates, which could have significant positive influence during data center upgrading on cabling and costs. IBM G8264 switch is such a switch that is specially designed for data center, which is suggested to be used at layer 2 or layer 3, providing non-blocking line-rate, high-bandwidth switching, filtering, and traffic queuing without delaying data. However, to make full use of these switches, you should select proper connection components and cabling plans. This post will take IBM G8264 switch as an example to illustrate how to take full advantages of the switches in data center. The first step to make full use of a switch is to have a full understanding of the switch you are using. There are many ways to understand your switch. While the most direct method is to understand the ports on the switches. This method also works for IBM G8264 switches. As shown in the following picture, which is the front panel of IBM G8264 switch, the most outstanding part of the switch is the 48 SFP/SFP+ ports. It occupied most space on IBM G8264 switch front panel. These ports can support data rate of 1G/10G. Four QSFP+ ports for 40G are beside these SFP/SFP+ ports. There are three another ports for other use on the from panel: one 10/100/1000 Ethernet RJ45 port for out of band management, one USB port for mass storage device connection and one mini-USE console port for serial access. It is clear that IBM G8264 switch can support data rate of 1G, 10G and 40G. The following parts illustrate how to connect IBM G8264 with the target devices in 1G, 10G, and 40G network separately in details. During the cabling in data center, distance is always a factor that cannot be ignored. The transmission distance required, can largely decide the cabling components selection. To accomplish the 1G connection of IBM G8264 switch and target devices, there are several methods according to transmission distance and transmission media (fiber optic or copper). For distance up to 100 meters, RJ-45 1000BASE-T SFP transceivers with UTP Cat5 cables are suggested, cause they are based on copper and is cheaper than fiber optic components. However, if you want reach a longer distance with good transmission quality, it would be better to use fiber optic cable and optical transceiver. By using 1000BASE-SX SFP optical transceivers with multimode fiber, the transmission distance is up to 220 (62.5 μ multimode fiber) meters and 550 meters (50 μ multimode fiber). 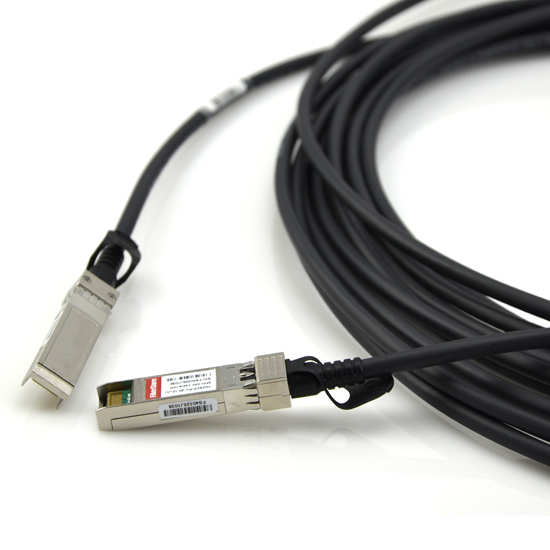 For long distance transmission, single-mode fiber optic cables are suggested to be used with 1000BASE-LX SFP optical transceivers, which can connect IBM G8264 switch with the target devices that are 10 kilometers far away. The following chart is the detailed product solutions for IBM G8264 1G connection. As mentioned, IBM G8264 switch supports 10G configuration. For 10G, there are mainly two methods: using DACs (direct attach cables) or using transceivers and patch cords. The beauty of using DAC is the eliminating of transceivers and reduction of cost. However, the transmission distance is limited to 7 meters by using DACs. If longer distances are required, 10GBASE-SR transceiver used with OM3 multimode fiber can support transmission distance up to 300 meters. If 10GBASE-SR transceiver is used with OM4 fiber optic cable, distance up to 400 meters could be reached. Using 10GBASE-LR transceiver with single-mode fiber optic cable, IBM G8264 switch can be connected with target devices that are 40 kilometers away. If the 10G ports number cannot satisfy the requirements, the one QSFP+ port on IBM G8264 can be split into four 10G ports, by using QSFP+ DAC breakout cables for distances up to 5 meters. For distances up to 100 meters, optical MTP-to-LC break-out cables can be used with the 40GBASE-SR4 transceiver. Kindly check the following table for IBM G8264 switch 10G cabling components solutions. For 40G connection, both fiber optic connection and copper connection can be built by using different components. 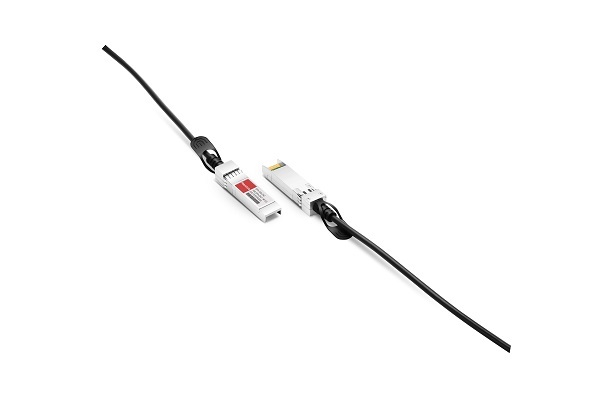 A 40GBASE QSFP+ to QSFP+ DAC can provide connection between IBM G8264 and target devices up to 7 meters. With multimode fiber optic cables, distance up to 100 meters (OM3) and 150 meters (OM4) can be reached, when using with 40GBASE-SR4 QSFP+ transceivers. For long distance 40G transmission, 40GBSE-LR QSFP+ transceiver and single-mode fiber optic cable with LC connectors are suggested. Related components for IBM G8264 switch are concluded in the following chart. To make full used of the switches in data center with great flexibility, both the selection of switch and cabling solutions is very important. IBM G8264 as a switch with great flexibility is an ideal solution for data center upgrading to 40G. The above mentioned modules and cables are all provided by FS.COM, which are IBM G8264 compatible and are fully tested on the IBM G8264 switches. Kindly contact sales@fs.com for more details, if you are interested. This entry was posted in Direct Attach Cable, Fiber Cabling, Network Solutions, Optical Transceiver Solution and tagged 40G QSFP+, 49Y7884, BN-CKM-QS-SR, BN-CKM-S-T, data center, IBM, IBM 40GbE, IBM G8264 on March 28, 2016 by Alice Gui.